Pre-heat the oven at 80°C. 2. Pat the steak dry with a paper towel. Season lightly with salt on both sides. 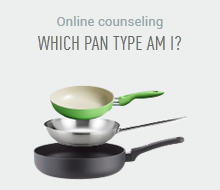 Heat the oil in the Cera Color pan. Cook the steak on medium heat on one side for about 8 minutes. As soon as red, clear meat juice appears on top of the steak, turn the steak and cook it for another 8 minutes. 3. As soon as red clear meat juice appears again on the surface of the steak, put the pan in the oven. Let the steak rest in the oven for approx. 10 minutes at 80°C. This will make the meat medium rare. 4. 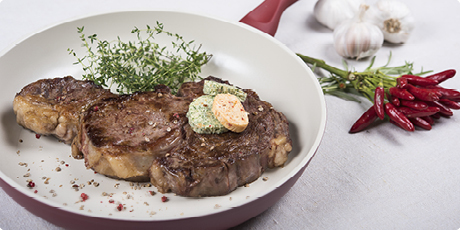 Serve the rib eye steak with chili-ginger butter and hazelnut-and-herbs butter. Clean the chili peppers, remove the seeds, chop the pulp into small pieces. Peel the ginger, chop it into small pieces. You will need 1 level teaspoon of it. 2. Slice the butter into small pieces, put them in a deep plate. Mix the butter, chili, ginger, sweet paprika, coriander and nutmeg with a fork. Season the chili butter with salt. Chop the parsley and garlic into small pieces. Slice the butter into small pieces, put them in a deep plate. Mix the butter, parsley, garlic, hazelnuts, mustard, lemon zest and lemon juice thoroughly. Season the hazelnut-and-herbs butter with salt. 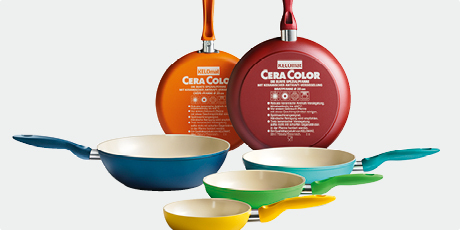 The big round pan of the KELOMAT series CeraMic COLOR is a reliable partner in your kitchen. 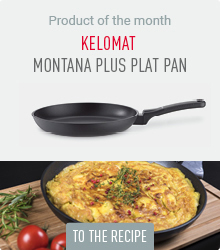 With its diameter of 28 cm, it is perfect for dishes like big steaks, but just as well for egg dishes, vegetables stew or other meat dishes for multiple persons.